If I asked you for a dollar and promised 94 cents in return, would you do it? But beneath the bright lights and lavish decor of Las Vegas casinos, you can find hordes of mesmerized patrons making a very similar wager over and over again. The City of Sin is home to 197,144 slot machines in total. And on average, these devices have a 93.77% payback rate. 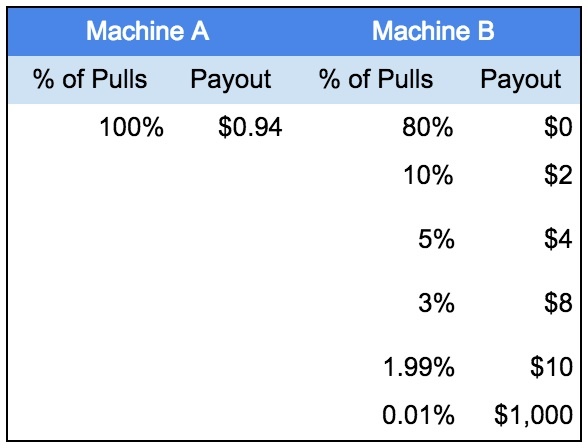 This means every time someone inserts a buck and pulls the lever, they will get $0.9377 back on average, effectively losing 6% with each pull. So if this is such a losing bet, why on earth do people keep coming back to them? The answer comes to us in yet another lesson on behavioral psychology. One that the gaming industry exploits to make otherwise irrational behavior habit-forming. And one that you can utilize to get users to keep coming back to use your software product (hopefully, of course, by less malicious means). In the 1950s, famed psychologist B.F. Skinner set up an experiment by giving lab rats two different levers that, when pressed, would give them pellets of food. The first lever yielded the same amount of food each time, while the second lever would sometimes yield a small pellet, sometimes a large pellet, and sometimes no pellet at all. Skinner observed an enormous variance in the rats’ behavior with the two levers. It seemed those with the variable lever were engaging more often and longer than those with the more predictable one. The science behind these observations comes down to something called Variable Rewards. And the same phenomenon is observed in human behavior too. It has to do with how our brains process dopamine, the neurotransmitter that supercharges our desires. It turns out that more dopamine is released in anticipation of the reward rather than in the receipt of the reward itself. So when reward schedules are predictable, we know exactly what to anticipate and our dopamine levels stay in check. But when rewards are highly variable, our brains are overtaken by dopamine and relentlessly search for their next reward. Which machine would you rather play? Skinner’s work suggests you would choose Machine B. After all, who would want to play a slot machine where you will predictably lose 6% every time you make a wager? But what’s fascinating is these machines have the exact expected return on a $1 wager: $0.94. Even though the second machine has a negative expected return, the anticipation of a potentially high reward (the $1,000 jackpot) supercharges our desire. However unlikely the jackpot is, the probability is always fixed and this next pull could. be. the. one. Variable rewards are not just for casinos. They’re used by some of the most popular technology products to keep users coming back time after time. Nir Eyal, author of Hooked: How to Build Habit-Forming Products, is perhaps Silicon Valley’s foremost expert on variable rewards. In his book, Eyal suggests we seek three types of variable rewards: rewards of the tribe, rewards of the hunt, and rewards of the self. We won’t go any deeper into the types of variable rewards or any of the science behind them (seriously, you should read Nir’s work). Instead, we’ll focus on five strategies that successful tech products use to get new users to derive variable rewards faster. Strategies that you, too, can use to improve your product’s user adoption and engagement rates. Have you ever wondered why Tinder’s UI pattern has been adopted in seemingly every vertical or niche? The prolific dating app is entirely built around the pursuit of variable rewards. Behind every swipe is another potential match. Is it the $0 reward on which you swipe left, the $10 reward with whom you go on a couple of dates, or the $1,000 jackpot who becomes your life partner of 50+ years? All you have to do is keep on swiping to find out. And it’s this design around variable rewards that has helped Tinder claim an unbelievable market share among mobile dating apps in two quick years. Many times the variable rewards are not as immediately accessible as those of Tinder. In these cases, users must “invest” in the product in order to receive variable rewards. With Facebook, for instance, you must first follow the people you know to receive the variable rewards of their updates. Airbnb connects travelers looking for unique traveling experiences and hosts who have extra space to rent. But in order for both groups of users to get value, either through the form of a good home away from home or a good houseguest, they must verify their personal information and are encouraged to connect their social accounts. Connecting these accounts could be considered your investment in anticipation of a variable reward (a good stay or a good house guest) at a later date. You may not actually receive a reward right away, but it will affect the rewards you derive later. Airbnb does a nice job of conveying value in its copywriting to influence users to connect their accounts. Likes, messages, status updates, etc. Social networks live and die by variable rewards they offer to their users. But how many have come and gone, unable to build a community experience that keeps users coming back? For most social networks, new users must “invest” in the network to pursue variable rewards, just as we said with Facebook above. Take Twitter for an example. In order to reap variable rewards on Twitter (favorites, RTs, relevant information, etc. ), you need to invest by following the right people and coming back to produce valuable content on the platform that makes you worthy of such rewards. But Yik Yak completely circumvents this investment phase that typically bottlenecks the amount the value users get from social networks. Rather than requiring users to find friends or follow people with pre-existing relationships, the app automatically places new users in a conversation with fellow “Yakkers” in the 10 miles around them. By skipping the investment phase, Yakkers can seek variable rewards effortlessly. Any given new user could get her “Yak” upvoted 100+ times without first needing to invest in her network. That would be much harder on a social network like Twitter, Instagram or Facebook. And, like Tinder, this is a big part of the reason why Yik Yak has grown so quickly. Just because your product doesn’t have variable rewards as obvious as those for a dating app or social network, doesn’t mean they don’t exist. Take MailChimp, for instance. MailChimp is not too different from other email tools out there. 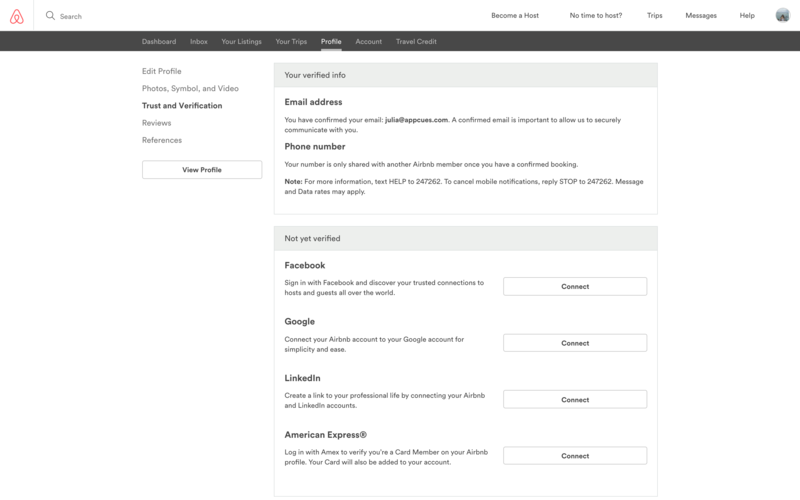 You can manage lists, design stylish emails, and send out newsletters to your customers or followers. But when users aren’t taking those actions in the app, MailChimp orients its platform to focus on variable rewards that come from them. 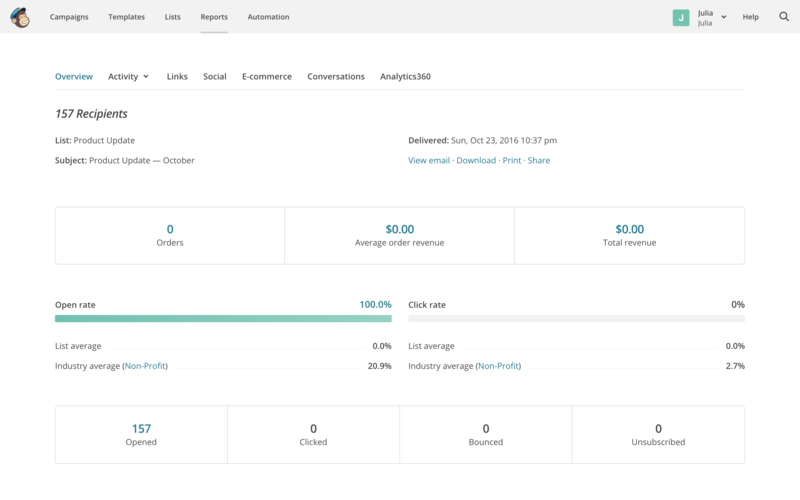 Users can see how quickly their email distribution list is growing, and analyze the open and click rates of their most recent campaign. Drafting an email may not give you a rush of dopamine. But after you click send, the anticipation of the email’s performance certainly will. There are some products where steady usage doesn’t naturally lead to variable rewards. In these cases, it’s important to create them yourself to encourage consistent product usage. Many products do this through some type of gamification. Duolingo does a nice job of this. Learning a language has a very steady, predictable reward path. Just think back to high school–first you start a new lesson (a set of vocabulary, let’s say), then your class will spend a couple of weeks on it (homework, quizzes, perhaps a test)–and then suddenly that knowledge becomes second nature. There’s nothing surprising or variable about hard work leading to results. 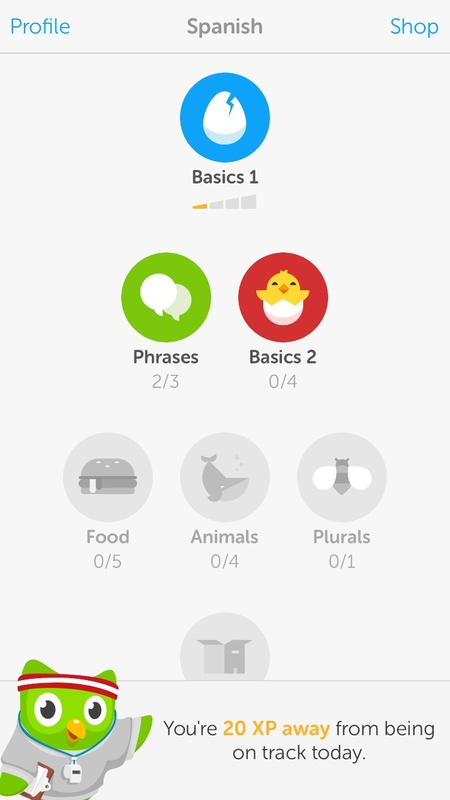 So in order to create variable rewards, Duolingo created XP, its learning currency. Users get XP by completing exercises. And based on their performance in those exercises, users receive varying amounts of it and unlock other various achievements along the way. It’s often difficult to feel personal development. But with XP, it’s much easier for Duolingo users for their learning to feel tangible and present. Variable reward schedules can drive our brains crazy. And harnessing the power of variability can give your product the same habit-forming phenomenon that keeps people in front of a slot machine for hours on end. But they aren’t just used to exploit people. Variable reward schedules can also be used to encourage good behavior and in creating products that truly help people. Each product from the examples above has a well designed variable reward schedule that is congruent with the value proposition of the product itself. Before you orient your product around variability, you should know exactly what rewards your users expect and crave from your product. You also cannot expect users to get there right away. Variable rewards are not as much about the user’s first run experience, as they are about what drives the user back for the 2nd, 10th or 100th+ session. In that sense, part of the role of user onboarding is to set up the receipt of downstream variable rewards. For some products, this can require substantial “investment”. For others, it can be accomplished by keeping a user’s attention focused and hiding complexity. And still for others, like Duolingo, the variable rewards need to be explicitly created and introduced to the user.